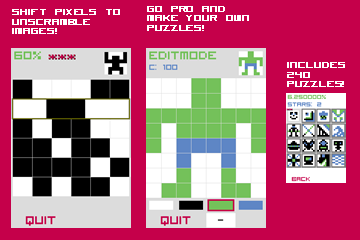 April 05, 2011- Pixel Shift is now available for iOS and Windows Phone 7. Learn how Pixel Shift was made at the Bioroid Dev Blog! Like Puzzles? Pixel Shift is for you! Do you like to draw? Pixel Shift is for you! Don’t like either? Pixel Shift is still for you! Hey, it's free! Try Pixel Shift, the awesomely addictive puzzle game where you shift pixels to unscramble pixel images! Includes 16 puzzles with unlimited replay. Get shifting! Go Pro and get 224 more puzzles AND a full puzzle editor to create your own puzzles! - Need more pressure? Enable the timer in the options!